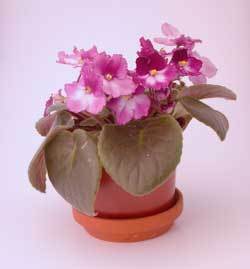 Generally speaking African violets are a fairly easy to care for houseplant. This is a guide about the care and feeding of African violets. The African violet, one of America's most common houseplants, comes in an immense range of varieties. Although it is not difficult to grow, it does demand constant care and attention. Above all else, that is the secret to successfully growing and maintaining this diverse and beautiful plant. 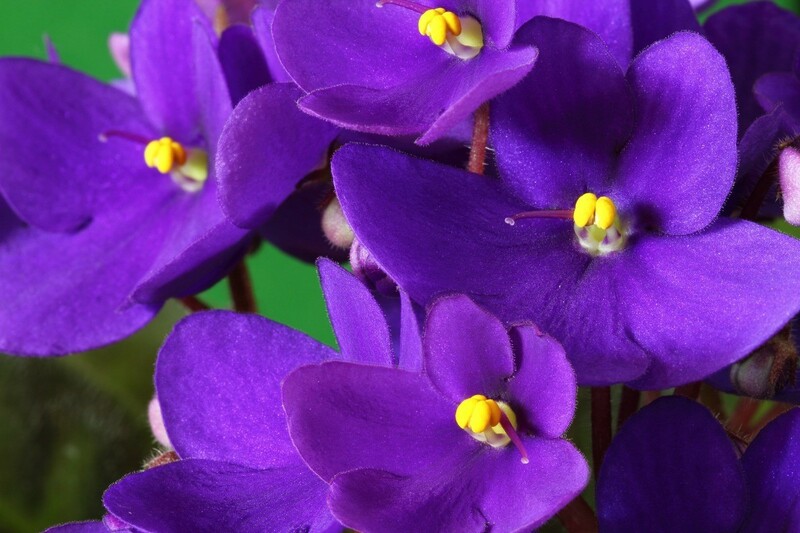 There are three primary areas to consider concerning the health of African violets: light, food and water, and general environmental conditions. These houseplants can be extremely finicky when it comes to their care, and upsetting the environmental balance will result in poor plant health. In order to bloom, African violets need quite a bit of light, more than most people first realize. Moderate light is best, with exposure to direct light for long periods causing damage. Northern and eastern exposures tend to give these plants adequate amounts of sun. If you're unable to capture enough natural light for your violets fluorescent tubes placed about 8 inches above the plants for 12-16 hours a day will enable flowering. If your plant is receiving inadequate light you'll see dark, lean, blue-green leaves with long petioles. Attaining the right amount of light for your African violets can be tricky, but what is most difficult about caring for this plant is simply watering. The right balance is hard to find and maintain. Too little water and the plant won't grow or flower properly; too much water and the plant will often rot. One method that works well is placing a saucer of water under the plant, allowing it to sub-irrigate. The plant will take water up through the bottom of the soil. If you use this method leave the plant in the water long enough to make the top inch of soil moist; remove the saucer and do not water again until that upper layer is dry. This will help guard against rotting. It is also good practice to water these plants occasionally from the top; this will help leech out accumulated salts, which can harm the plant. When watering from above use water that is room temperature, otherwise cold water can damage the sensitive leaves, leading to an unhealthy situation. Proper fertilization by using a complete fertilizer, which is dispensed at a low rate, is recommended. If over fertilized African violets will suffer from poor flowering, exposure to soil salts, and excessive growth. Other general environmental conditions that influence the successful growth and flowering of your African violets include proper temperature, soil make-up, and problems associated with insects and disease. Temperatures between 65 and 80 degrees F are ideal for African violets. Room and water temperatures below 50 degrees F will damage the leaves, causing them to wither and darken. Temperatures above 85 degrees F will result in poor plant and flower growth and dry, damaged leaves. Soils that drain poorly and compact easily, such as garden or field soils, will not sustain African violets. Loose, porous soil with a pH level between 6.0-6.5 is vital to maintaining good growth. Pasteurized, fertile peat-based soils are recommended. The good news is that if African violets are tended properly they rarely have trouble with disease or insects. Along with common problems such as mites and mealy bugs, these houseplants are susceptible to fungal disease brought about by the use of cold water on leaves and nighttime exposure of leaves to water. Over watering can also cause fungal problems. Once again, take care when watering these plants. African violets demand daily care and the right conditions in order to thrive. Once you've created and maintained those conditions, you'll have a beautiful plant that will flower continuously throughout the year. What living arrangements do African Violets prefer? How long or often do their little purple flowers last or bloom? African violets love lots of light, but direct sun is hard on them and will scorch their leaves. They do really good in a north window, or a window with a shade tree filtering the sunlight, or even a grow light if you don't have enough sunlight available. They also like their soil to be damp. Direct watering causes them to get leaf rot, so they really like a violet pot (a special planter that has 2 pots: 1 for the water, and 1 that sits inside it that holds the soil and the plant), or if you have a regular pot, water it from the bottom, or use a water globe that you fill and it sticks down into the soil to water it from below. There is also an African violet food that comes in drop form that I like to give mine every now and then. When your blooms fade, remove them to give your plant the strength to keep going. If you give your plants the things it likes as mentioned above, then it will bloom it's heart out for you and will bloom all year round. Sometimes I like to start new ones for family or friends. You can do this by removing a leaf and poking a toothpick through it to hold it up, put it in a glass of water with the leaf base just in the water and place it in a sunny window for a week or so. When you have a few roots started, plant your new baby plant in the same kind of pot and treat them the same as you do the mother plant.